Just south of St. Augustine Beach is a beautiful stretch of natural coastline called Crescent Beach. The sand is hard-packed, which makes it ideal for beach bike riding, walks, running, frisbee, volleyball, and other fun beach-side activities. During the months of March – September, you can even drive your vehicle on the beach (for a fee). Visitors and residents alike enjoy the ocean waves and make time for swimming, surfing, skim and boogie boarding. Occasionally, there is even horseback riding on the beach. 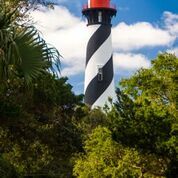 Crescent beach is a smaller community than St. Augustine Beach, but that is just perfect for those who want to get away from it all and enjoy a peaceful atmosphere. Though smaller, there are still plenty of desirable properties to purchase at Crescent beach for primary residence or for rental income purposes.